Willemstad, Curaçao (Netherlands Antilles) (AFP) - A sleepy island best known for beaches and a blue liquor named after it has become the focus of a tense bid to bring aid by sea to Venezuela, in the face of warnings that the country's military will block it. A plane carrying private donations of food and medical aid from Venezuelans in Florida landed on Curacao -- population 150,000 -- which lies 40 miles (64 kilometers) from Venezuela's coast. Venezuelans on the island were preparing Friday to transfer the goods to the nearby seaport where they said a ship was ready to take it to Venezuela. Such a move could lead to a confrontation with the Venezuelan military. The government of President Nicolas Maduro has ordered its sea and air borders with Curacao to be closed to block the aid. It is also resisting attempts by Maduro's rival, self-declared president Juan Guaido, to pass aid from Brazil and Colombia. "Curacao is one of the most important points in terms of how difficult it is to operate at sea," said Carlos Faria, one of the organizers of the aid effort on the island. "It is risky but we are full of hope, valor and intelligence." Maduro has branded the aid a "show" and a smokescreen for a US invasion. Labor unions on Curacao called protests this week against the use of the island to channel aid, local media said. Curacao is home to a refinery leased by the Venezuelan state oil company PDVSA. Washington has imposed sanctions on PDVSA, which exports a large share of its oil to the United States. The government of the island, in line with some 50 other countries, endorses Guaido's claim to be interim president of Venezuela. But it insisted it would not allow the shipment to enter Venezuelan waters "in a forced manner." "The shipments from Curacao will only take place when the authorities in Venezuela agree," it said in a statement. That will only happen either if Maduro lets the aid in -- which he was refused to do -- or if Guaido prevails and takes control of Venezuela. 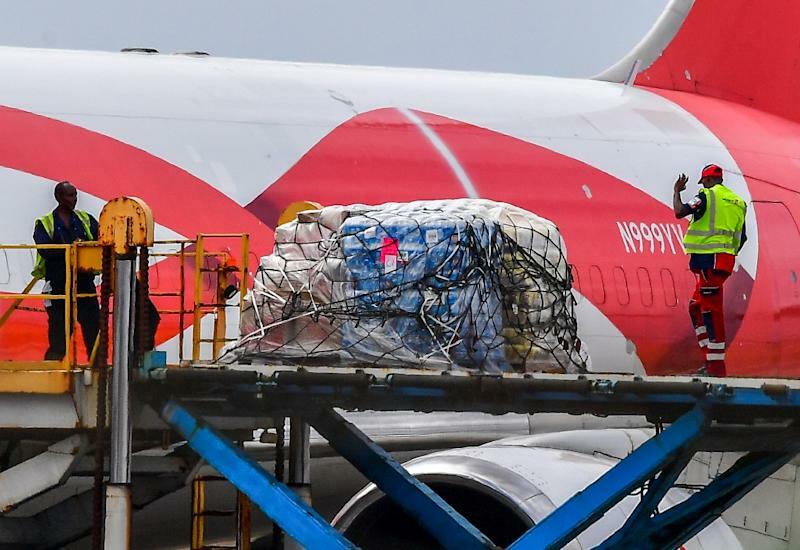 The leader of the organizers of the Curacao shipment, Miguel Rodriguez, said the plane contained 50 tons of food and medicine for Venezuelans suffering shortages. Guaido has said volunteers will start trying to bring the aid into Venezuela from Saturday. But organizers in Curacao admitted they had no idea how or exactly when their aid shipment might get under way. "How will the humanitarian aid get there? We don't know. Nobody knows. I think this is all happening from one hour to the next," said Ana Madero, a Venezuelan resident of Curacao who is volunteering in the effort to transfer the aid shipment. "But I still believe in God and I know that miracles can happen and I know that my country is going to be free very soon." An autonomous state within the Kingdom of the Netherlands, Curacao hosts a US military "forward operating location" that provides support for anti-drug operations in the region. Dotted with five-star beach hotels and a popular diving destination, it gives its name to a liquor made from a fruit grown on the island. Nearby Venezuela, by contrast, is stricken with hyperinflation and shortages of food and medicine. The UN refugee agency UNHCR, citing local authorities, estimates there are 26,000 Venezuelans on the island -- their numbers swelled by those who have fled there during the recent years of economic crisis. Amnesty International and Human Rights Watch issued reports last year accusing the Curacao government of refusing the Venezuelans their right to international protection. The administrator of the US development agency USAID, Mark Green, tweeted last week that he had visited Curacao and discussed possible cooperation with the island to channel official US aid to Venezuela. The island's government stressed that the US forward base will play no part in any aid operations.